At St. Francis we believe that children, by virtue of their baptism, are full members of the Body of Christ. This means that they are full participants in our common life of prayer, witness and service. We welcome children and their families and seek to proclaim the Gospel in ways that let them receive and respond to God’s love. Our children’s ministries are designed to nurture children in their faith through education, fellowship and by allowing them to share their unique gifts with all of us. A robust children’s program awaits you at St. Francis. 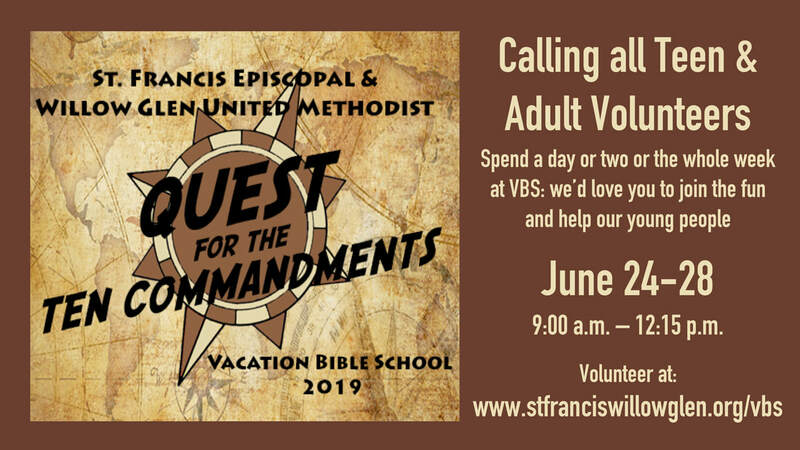 In the last full week of June, we team up with Willow Glen United Methodist Church down the street to co-host a camp-style Vacation Bible School. The fun includes worship, Bible stories, crafts, science, and play. Preschool-aged children through 5th graders (completed) are invited to participate. Each year we choose a theme to explore for the week such as Moses: Wilderness Escape, Building the Peacable Kingdom: A Person's a Person No Matter How Small, Rock The World, Amazing Love: Traveling with the Apostle Paul, etc. With 200 participants we can create hands-on learning experiences that can't be had in the church school classroom. St. Francis teens and adults also participate as teaching assistants and activity leaders. This is a truly wonderful week where we celebrate God’s gift: our children. It’s especially fun to see our own St. Francis youth graduate from participant to volunteer and help with the young children. The volunteers who give their time to this event end up receiving just as much (if not more) as the young participants. This is a once-per-year event that you don’t want to miss. St. Francis members and their friends receive priority registration in March. On special days there is no church school, and children and adults worship together for a full-length service at 10:15 a.m. A good example is our annual St. Francis Day in October when everyone brings their pets (live or stuffed) for a special blessing of the animals. It’s not uncommon to see dogs, cats, rats, guinea pigs, hamsters, snakes, chickens, and birds sitting in the pews. If your pet is too afraid to join us that day, please bring a picture of your pet to be blessed. We mark the church year together with special family and children’s services including, Christmas Pageant, Christmas Family Service, Children’s Ash Wednesday, Children’s Good Friday Service, and the Easter Vigil Campfire, etc. Singers of all abilities, 4th through 5th grade, are invited to join the St. Francis Junior Choir. We have short practices after church one or two times per month. The Junior Choir performs several times during the school year. For some performances, members are dressed in choir robes provided by the church. We are always looking for new members to join the choir. If your child is interested, please send a message to Kristina Nakagawa, our Music Director. The teen choir is for students grades 6 through 12. There are short practices two times per month, and on other scheduled occasions as needed. Singers of all abilities are invited to join. The teen choir typically performs music that is a step up in difficulty from the Junior Choir, in accordance with the natural progression of leveled music experience. In the second week of June, church school takes a break, and we begin our Summer programs, which are offered to all age groups.